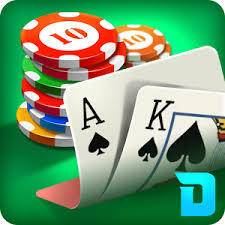 DH Texas Poker or DH Texas Poker – Texas Hold ‘Em is a game created by DroidHen. 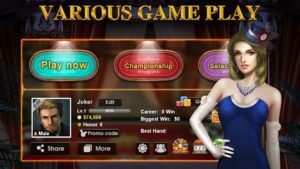 This online poker game app aims to let players experience how it is to play in Vegas VIP tables, winning loads of chips and competing in games for rewards. DH Texas Poker can be played using four modes: Play Now, Sit&Go, Select Casino and Private Room. The player has the option to play alone or play with friends and even with other online players. The Private Room game mode allows you to invite a friend in the Private Table. From the beginning, you will be awarded with free chips worth $50,000. You can begin playing and every day, there are special offers plus a login lottery. There are various chip packages available, and you are also allowed to buy up to 8 tickets. As a bonus, if you connect the app with Facebook and invite your friends to play DH Texas Poker, you get 5,000,000 bonus chips! Imagine all those chips combined, it’ll surely give you an awesome gambling experience! DH Texas Poker – Texas Hold ‘Em isn’t for everybody, but for poker lovers, it is fun to play and very generous with money. It’s a great way to meet new friends, because it allows you to play with other online players. The app does have its downsides though – some players say that you need to buy some chips to win a single hand while others state that DH Texas Poker isn’t the best experience out there for poker players. The app’s layout is simple, but it looks pretty decent on your smartphone or tablet. On top of that, the interface is pretty user friendly that it’s easier to navigate. Graphics is not the best, but it’s pretty okay. The game’s community has some serious high skill levels that will always bring a challenge, and this is seriously important when you’re an avid poker player. Thus, the competition is also a bit tougher, but sweeter! Play with a highly skilled community of players in DH Texas Poker – Texas Hold ‘Em and enjoy different game modes. It’s not only fun to play but you also get a lot of free chips!